Since the September 11 attacks on the United States, the Bush administration has come under fire for its methods of combating terrorism. Waging war against al Qaeda has proven to be a legal quagmire, with critics claiming that the administration’s response in Afghanistan and Iraq is unconstitutional. The war on terror—and, in a larger sense, the administration’s decision to withdraw from the ABM Treaty and the Kyoto accords—has many wondering whether the constitutional framework for making foreign affairs decisions has been discarded by the present administration. John Yoo, formerly a lawyer in the Department of Justice, here makes the case for a completely new approach to understanding what the Constitution says about foreign affairs, particularly the powers of war and peace. Looking to American history, Yoo points out that from Truman and Korea to Clinton’s intervention in Kosovo, American presidents have had to act decisively on the world stage without a declaration of war. They are able to do so, Yoo argues, because the Constitution grants the president, Congress, and the courts very different powers, requiring them to negotiate the country’s foreign policy. Yoo roots his controversial analysis in a brilliant reconstruction of the original understanding of the foreign affairs power and supplements it with arguments based on constitutional text, structure, and history. Accessibly blending historical arguments with current policy debates, The Powers of War and Peace will no doubt be hotly debated. And while the questions it addresses are as old and fundamental as the Constitution itself, America’s response to the September 11 attacks has renewed them with even greater force and urgency. "A convincing and judicious case for the need in a post-September 11 era to re-evaluate what the Constitution says about foreign affairs. Mr. Yoo’s book covers a broad range of foreign policy areas like international law, treaties and multilateralism and addresses each with clarity and scholarly care. 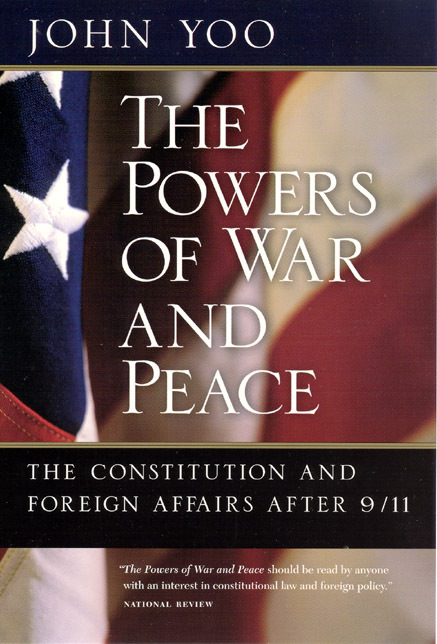 But at its heart, The Powers of War and Peace is a scathing criticism of those whom he argues have neglected their constitutional responsibility. . . . A valuable contribution to the tradition of works about the Constitution and foreign affairs. Like The Prince, it uses insider knowledge to boldly state political truths that others dare not utter." "Can the president of the United States do whatever he likes in wartime without oversight from Congress or the courts? This year, the issue came to a head as the Bush administration struggled to maintain its aggressive approach to the detention and interrogation of suspected enemy combatants in the war on terrorism. But this was also the year that the administration’s claims about presidential supremacy received their most sustained intellectual defense [in] The Powers of War and Peace." "There is a refreshing elegance to Yoo’s theory. Forgoing hair-splitting doctrinal debates about congressional and executive claims to primacy in foreign affairs, Yoo tells the two branches to duke it out politically, deploying their allocated powers to reach a political equilibrium. By shifting the debate from the legal to the political arena, Yoo’s theory promotes frank discussion of the national interest and makes it harder for politicians to parade policy conflicts as constitutional crises. Most important, Yoo’s approach offers a way to renew our political system’s democratic vigor. . . . An impressive scholarly achievement, The Powers of War and Peace should be read by anyone with an interest in constitutional law and foreign policy."